One of the things I find useful about OS X is the ability to zoom in on anything on the screen—you’ve been able to do this with Command-Option-Minus and Command-Option-Equals for quite a while, and recent updates have added the Control-scroll wheel zoom method. I find this very useful in many situations—with Web sites that have too-small text, or to view an image you’d like to see a bit more closely, for example. But where it really shines is for playing back Flash or QuickTime embedded video in your Web browser. OS X’s scaler does a good job, as you zoom in, so you can turn those 320-by-240 Web videos into something that you can watch without squinting or reaching for the binoculars. While not as crisp as higher-resolution source video, it’s actually not a bad alternative. There is, however, one obvious problem when viewing videos in this way: the mouse cursor. As you zoom in on the movie, the cursor also gets larger and larger. That wouldn’t be a problem if you could just toss it off to the side, but you can’t—if you try, you’ll find that your nicely-centered video goes scrolling off to the side as well! And as you can see in the screenshot at right (snipped from Jason’s recent video blog about LaunchBar ), it’s kind of hard to miss the cursor sitting on top of the video. There are a number of potential solutions to this problem, including my favorite, the “fake a screen shot” method. Zoom in the screen to your desired level, press Play to start the video playback, and then press Shift-Command-4. This is the keyboard shortcut for “capture region to file,” and the cursor will change into a crosshair. At this point, you can move the cursor off the video frame, with the video locked into its present position. When you’re done, just click the mouse to regain control over the cursor. Another method is to press play on your video before you zoom, then click in your browser’s URL entry area or the search box. Now zoom and center the video, and then just press the Up Arrow key—when you do, the cursor will vanish. 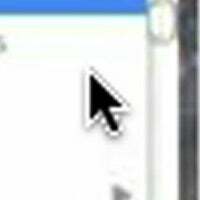 The disadvantage of this method is that the cursor will return if you bump the mouse; with the screen shot method, the cursor won’t return until you click the mouse. Either way, it’s much more enjoyable watching zoomed-in videos without having to also watch the extra-large mouse cursor.